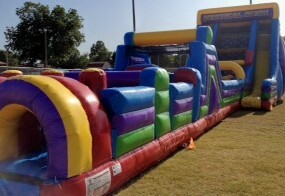 What do you get when you combine our 40ft Obstacle Course with the Verticle Rush? You get the EXTREME Obstacle Course! 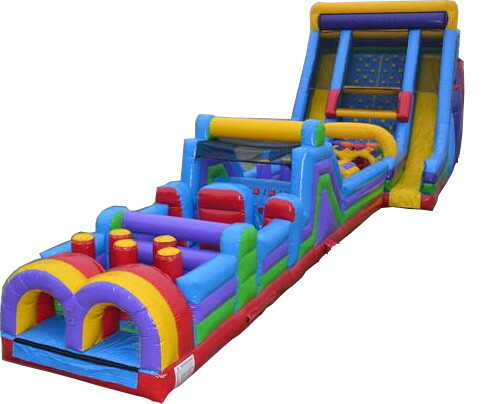 68ft long and 22ft tall you will be tired after you race your opponent thru tunnels, pop ups, crawl thrus, & finally up the large rock climbing wall and down the slides! Take it to the Extreme! 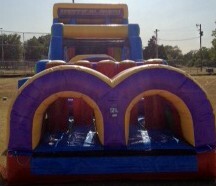 Rental fee includes all day rental including delivery, setup, & takedown. HUGE discounts on multiple piece rentals. Call for details.! Price includes delivery to Muskogee, Ft. Gibson, Okay, Oktaha, Wagoner, Warner, Porter, & Checotah. Call for additional price for other areas!